The interest in some sort of faster payments service in the US, as far as I can tell, comes mainly from non-banks whereas banks are not that bothered (that’s my six second summary of the Fed consultation!). Incumbent inertia is a considerable factor to overcome when moving forwards, so it’s not surprising to read some fairly pessimistic comments. Stephen Ranzini, president and CEO of University Bank in Ann Arbor, Mich., who has designed bank-centric, Internet-based payment systems. “The way things are going, it might not happen in my lifetime”. I think this might be overly negative, because once a faster payments platform is in place, it provides an opportunity for the banks to offer new services and this should stimulate more innovative thinking. And I’m thinking about a real faster payment service (FPS) as in the UK, rather than just same-day settlement on the existing rails. Just thinking short-term, same-day settlement would extend our ability to offer core products and services: expedited bill payments through online banking; person-to-person and account-to-account payments; just-in-time supplier payments and premium small business services; and weekly payroll for hourly workers. I think that same-day settlement is sufficient to stimulate many of these services. Settlement has to be effectively immediate for these to work. This is what happens in the UK. Although the technical settlement takes place in three windows during the day, the participants make the funds available immediately. So to give a concrete example (pun intended) when the builder arrives at your house with a load of bricks or tarmac or whatever else, you can pay him on the spot using your mobile phone and he will get immediate confirmation. In a mobile world, payments have to be as instant as a text message. This, incidentally, is one of the reasons why my sons much prefer PingIt over mobile banking. If I send money to them using mobile banking then the transfer is immediate via the FPS but they have to login using their mobile banking application to see of the money has arrived. By contrast, if I send them the money using PingIt, which is Barclays front-end to the very same FPS, they get a text message within a couple of seconds telling them that the funds are available. (And now you can send money to Twitter names as well as mobile phone numbers too, so if you want to try it out, register for PingIt and send a fiver to @dgwbirch and I’ll let you know if it arrives). So, to recap, in the UK there are three settlement windows and transfers of up to £100,000 are to all intents and purposes instant. You don’t necessarily need to build a new system to do this. Adding multiple settlement windows into same-day settlement by ACH could achieve the same result and this is, indeed, what NACHA is proposing with the interesting addition of an interchange fee to incentive the banks. The [NACHA] plan is to have a phased approach that would eventually, by March 2018, introduce two new same-day settlement windows for a total of three ACH network settlements for credits and debits every 24 hours. Transactions over $25,000 would not be eligible… To help recover costs and ensure a fair return on their investments, Receiving Depository Financial Institutions (RDFIs) would benefit from an interbank fee of 8.2 cents per same-day transaction, paid by Originating Depository Financial Institutions (ODFIs). In the Europe, just as in the US, faster payment is going up the agenda. Yes, there is effectively immediate settlement between accounts in the UK, but there is as yet no pan-European (or even pan-eurozone) equivalent. This may be on the verge of changing though, because European Central Bank (ECB) is now nudging things along and they are involving more stakeholders, which I think is very good idea. In its second meeting, on 1 December 2014, the Euro Retail Payments Board (ERPB), a multi-stakeholder group chaired by the ECB, decided to step up work on the topics of instant payments in euro, and person-to-person mobile payments and contactless payments. The use of the phrase “instant payments” struck me as an excellent idea: more on this in a moment. I did wonder, when I was reading that article, whether the stakeholders being consulted by the ECB would include consumers. That might seem like an odd thing to say, but while I am generally unconvinced about consulting the public on anything at all, in this particular case I’m certain there’s no point. In my view, merchants and regulators are more invested in faster payments than are consumers. So where are we going with faster payments in Europe? 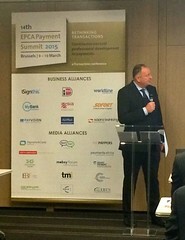 Well, when opening the 14th Annual European Payment Consulting Association Summit in Brussels this year, Weibe Ruttenberg, the Head of the Market Integration Division, DG Market Infrastructure and Payments, European Central Bank, reiterated that the era of “faster” payments is over and that the era of “instant” payments is here. Noting that in the UK almost all bank internet and mobile payments (some 98%+) route via the Faster Payment Service (FPS), Wiebe set out the basic requirements for payments in the modern economy. They were as you might imagine 24/7 operation, immediate notification, real-time settlement and so on. Wiebe was followed by Vincent Brennan, the Deputy Chair of the Euro Banking Association (ABE-EBA) Electronic Payments working group (and Head of Payments for the Bank of Ireland) who extended his argument by talking about “Instant Payments to Instant Commerce”. They have just announced an open forum on Pan-European Instant Payments. The forum is for PSPs, users, suppliers with a special focus on payments and operations, as well as relevant stakeholders in the European and global payments industry. I think this is another positive development and hopefully the “instant commerce” layer requirements can dovetail with what with be delivered by the “instant payments” layer. I’ll blog about this in a few days, but in the meantime I just wanted to note that there is a lot to say for this new focus on “instant” rather than “faster” payments. It distinguishes both from merely speeding up existing systems a bit (faster payments) and the UK operator (Faster Payments). I will use it from now on to mean exactly what it implies. Consumer and businesses might reasonably expect, two generations after the invention of the transistor and the laser beam, that sending money from one payment account to another should take no longer than sending an e-mail or a text message. Instant payments are a platform (which means APIs and all that) for commerce and therefore economic growth. The sooner the better. I really enjoyed the EPCA Summit, by the way, so a big thank you to Harry and his team foe putting it together. Interesting range of topics and a good opportunity to catch up with some pan-European developments. As an aside, Wiebe asked the audience (who didn’t know) how payments were made in Star Trek. I asked my good friend Tony Moretta on Twitter, and he reminded me that in the Federation there is no money because everything is free: there’s no scarcity. This was the Gene Roddenberry ideal as I understood it although there is mention of “Federation Credits” as the franchise evolved (including the intriguing comment that in the 24th century, some merchants would not accept them. Tony cut through this Gordian knot by suggesting that the Credits were for external trade (although Vocalink tell me that they were also used to pay pensions for Federation citizens who retired outside of Federation territory) and not used within the Federation. But if there’s no scarcity, what would the Federation want in trade? I can’t figure this out, except to point out Nigel Dodd notes in his “Social Life of Money” that “Utopias from Plato through Thomas More to Star Trek don’t seem to include money” [Dodd, N. Utopia in The Social Life of Money. p.318-384 (Princeton: 2014). Star Trek is a utopia, and I’m not sure it should be a policy input to the ECB. As a single currency doesn’t work between Germany and Greece, it seems unlikely that it would work between Earth and Planet Q. It astonishes me when I read article after article about the problems with speed, security & fees related to ACH payments from different authors CEOs & supposed market experts & “innovators” without any of them touching on the topic of Check 21 payment processing & what it can do for the financial industry today. Fees: In today’s age of competitive business, margins have dwindled to all-time lows, competition is fears & the internet makes comparing products & prices just a few clicks away. That being said, typical ACH fees sit around 2.5%. With the lack of options, merchants are forced to eat these fees or potentially loose a client to a competitor who will, but fees such as these can make or break a business. Why should a transaction cost a percentage of any given transaction? It doesn’t cost more for the ACH system to move $10,000 vs $10. Recent litigations brought forth by The National Retail Federation against the Board of Governors of the Federal Reserve System demonstrated the frustrations of retailers looking to reduce fees was met with deaf ears by the Supreme Court. The industry is demanding change. NACHA has proposed developing a same-day ACH payments system (which would offer settlements 3 times a day, a far cry from real-time), but there are a few issues at play. Under the proposed deployment plan it would take years of expensive upgrades to implement the system & NACHA has proposed to increase fees by 8.2 cents to account for their costs. Fortunately, the Federal Reserve have expressed their dislike for adding an 8.2 cent interbank fee. Being that the NAFCU says it would not be “economically viable” without it, there appears to be a stand-off until a resolution can be negotiated. MyECheck has a patented solution to process transactions in accordance with the Check 21 act. established in 2004 to modernize the payment industry. They can process payments in near real-time to and from any checking account in the U.S. for a low cost fixed rate (25 cents or less). They have modern security measures in place to prevent fraud (there has yet to be 1 reported case of fraud) & does not permit for traditional charge-backs as seen via ACH.